1999 was a historic year for the Food Bank. We opened our very first branch in Durham, bringing us to three total branches across central North Carolina. We opened our first Child Nutrition Program to serve kids in need after school. We continued to settle in to our new Raleigh distribution center on Tarheel Drive. And we faced the devastating effects of Hurricane Floyd. 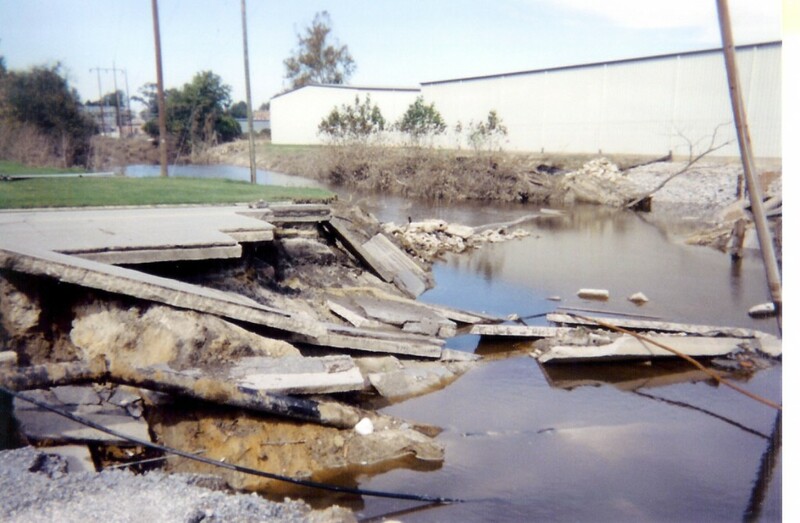 A road destroyed in the path of Hurricane Floyd. That year we had planned to open a distribution center in Greenville—our first branch in eastern North Carolina—in December. But when Floyd hit, we knew we had to move faster. So we opened our Greenville Branch three months early. The damage caused by the extreme flooding after the hurricane has been identified as the worst ever in our state’s history. Across eastern North Carolina, Hurricane Floyd devastated fifteen counties served by the Food Bank. As a first responder, the Food Bank stayed open 24 hours a day for three months after the storm to provide disaster relief services, with our Greenville Branch acting as the conduit for the crisis. Thousands of volunteers logged more than 31,000 hours picking up, loading, sorting, boxing, and distributing food and emergency supplies. During this time the Food Bank’s distribution more than doubled from 1.2 million to 2.6 million pounds a month, with staff making every effort to distribute food including driving through flooded streets. For a total of five months we responded to the need in the region, providing more than 5.3 million pounds of food and emergency supplies to those affected by the hurricane. When the immediate crisis ended, we ceased our disaster relief efforts and returned to regular operations. We expected less people would require our services, but the need did not diminish. Instead we continued to see an urgent need for emergency food, even after people had begun to resume their normal lives. When the worst of the storm was over, a great need that had not been previously obvious became painfully apparent. Hurricane Floyd may have expedited the opening of our Greenville Branch, but the plea for food assistance in the region has not subsided. Indeed we continue to serve not only as a first responder during times of natural disaster, but also as a leader in hunger relief. 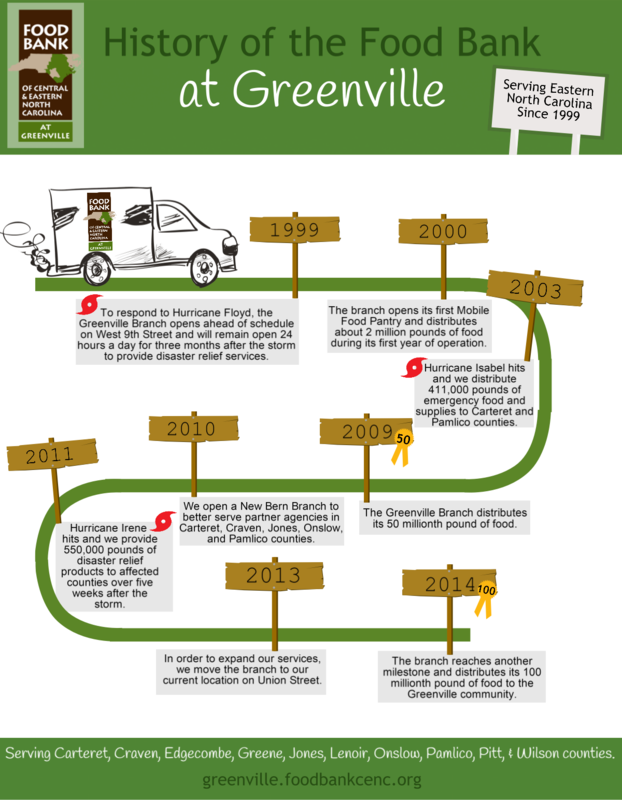 During the last 16 years, the Greenville community has come together to help our branch grow to meet the growing need. 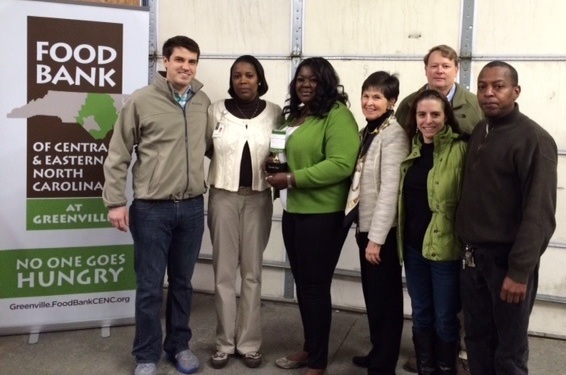 Most recently we celebrated a true milestone: The Greenville Branch distributed its 100 millionth pound of food since opening in 1999, the equivalent of 84.2 million meals for food insecure families across 10 eastern North Carolina counties. The record-breaking pound was given to Salem Missionary Baptist Church in Tarboro. To our donors, our partner agencies and all of our staff, it has been an awesome 16 years and a phenomenal milestone. Walt Disney once said, “You can dream, create, design and build the most wonderful idea in the world, but it requires people to make the dream a reality.” Thank you to everyone that has made our dream a reality. I look forward to the next 100 million pounds to help local families in need! Christal Andrews, Outreach Coordinator for our Greenville Branch, has worked tirelessly through many natural disasters in Eastern North Carolina. She arrived at the Greenville Branch as a Pitt Community College business student and AmeriCorps Service Member when we first opened in 1999. When Floyd hit, she became completely immersed in emergency relief efforts for the surrounding communities and began to build relationships with the partner agencies and also community leaders in the area. Over the years Christal has been active in relief efforts for three hurricanes and a major tornado. During hurricane season, Christal constantly watches the weather reports. When a pending storm has the potential to be catastrophic, she immediately makes contact with the partner agencies in its path. Thank you Christal for your hard work as a dedicated member of our first response team! Greenville Branch staff gather to celebrate the 100 million pound milestone. Christal Andrews proudly holds the commemorative trophy in the center of the group.